A modern farmhouse kitchen mood board with mixed metals and materials. I've been dreaming, pinning and planning a kitchen renovation ever since we bought our home. It's currently rockin' the original builder grade cabinets and the style is far from what I would choose our kitchen to look like. 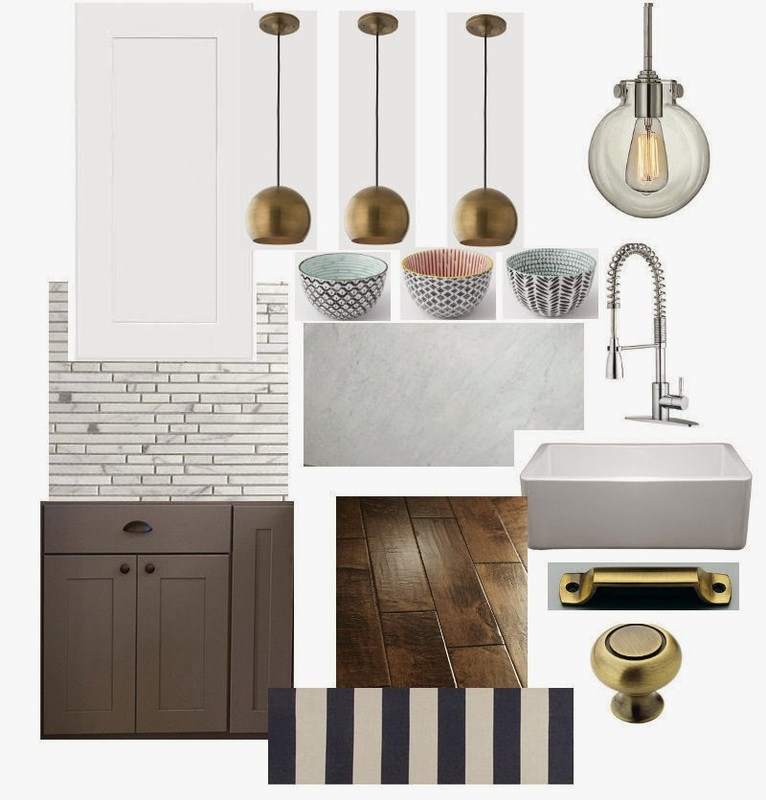 I'm sure I will change my mind 100 times, but I wanted to share the look I am going for and a few finishes and materials that I would love to eventually have in our kitchen. I like the idea of keeping the majority of the kitchen neutral then bringing in pops of color with fabric, rugs and accessories. The rug is from overstock and is the same one I have in the hallway. I love all the decorative bowls from West Elm, so when I saw these bowls I knew I wanted them for the Kitchen. I was torn between using all white cabinets or a combination of white (here) and gray (here). These are not the specific cabinets we will use, just the style I am going for. I think I finally made up my mind to use white on the upper cabinets and gray on the lower ones. The countertops will be white Carerra marble or something similar with stacked marble backsplash. I love the Duluth pulls from Restoration Hardware, but I don't think they make them in brass anymore. They come in 3, 4, 6 or 8 inches and I would use the 6-inch ones. If they don't have brass when the time comes to do the kitchen I may just go with the chrome pulls. I originally wanted very dark ebony floors but came to the realization that I DO have to live in this house. Dark floors with two adults, two kids and two animals is just asking for disaster. I'm thinking a medium color will be a better and save my sanity. The lighting and knobs/pulls have been really tricky for me. I love so many different styles and it's very hard to choose. 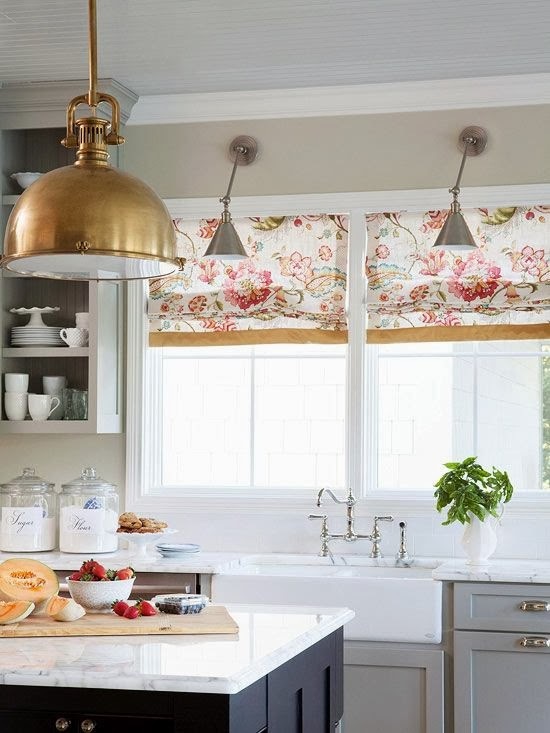 I'm currently loving the brass look and love the natural brass pendant from SchoolHouse Electic & Supply. I also love the Hinkley globe shade (here) in chrome. There is no decorating law that says you have to match finishes. Actually, it's becoming more and more popular to mix finishes, so I'm okay with mixing them up. The globe shade would go above the sink and tie in with the chrome faucet. While the brass pendants would go on the other side of the room above the counter that will be open to the stairs. 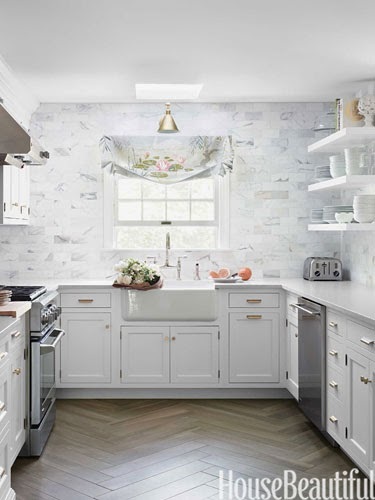 Here are some more inspirational kitchens that I am loving. 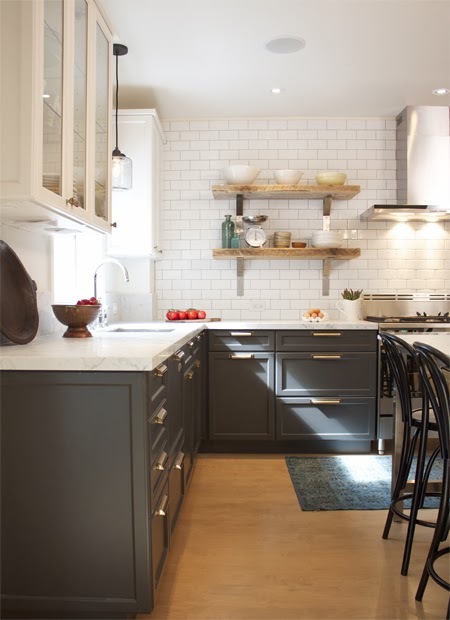 Edie over at Life in Grace has a beautiful kitchen that incorporates different finishes. 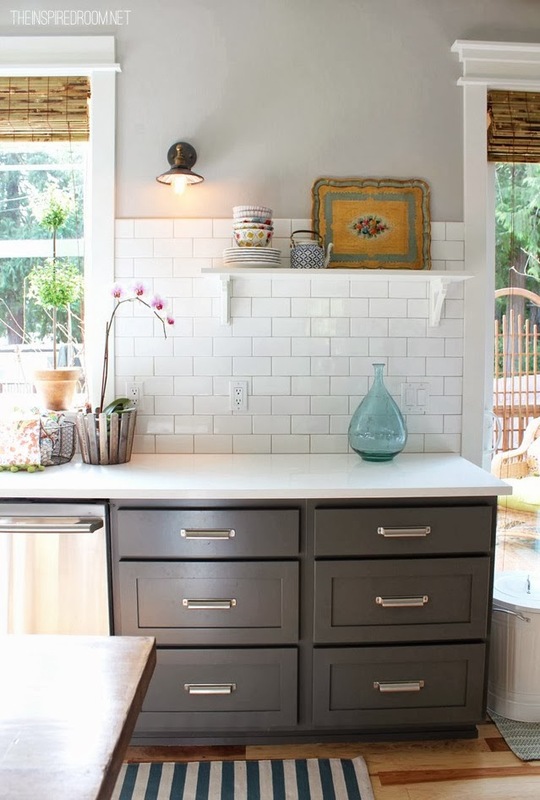 This kitchen remodel over at The Inspired Room is simply gorgeous. She uses the same Duluth knobs from Restoration Hardware that I love. We still have a long way to go until we gut and remodel our kitchen, but these beautiful kitchens are definitely giving me major inspiration! Love your inspiration board! Can't wait to see what you decide on! Thanks for sharing!